Pages From, Diary of a Lost Girl ! : Lost ! "I would so love to wear a lehanga. I even had a plan to buy one but sadly couldn't", she sighed. They were passing by some Suits, Saree's shops. Embroidered with various shining stone pieces, they all looked like river of cloth flowing in the showpieces with different colored stones in that river. All the dummies wearing those beautiful pieces were going to be in her dreams now for the next few days. Shop by shop they went .Glaring into the glasses. She was capturing every style, every color in her eye frames but He seemed a bit worried. Little lines on his forehead could tell that. "Hey, look. This one is pretty na. 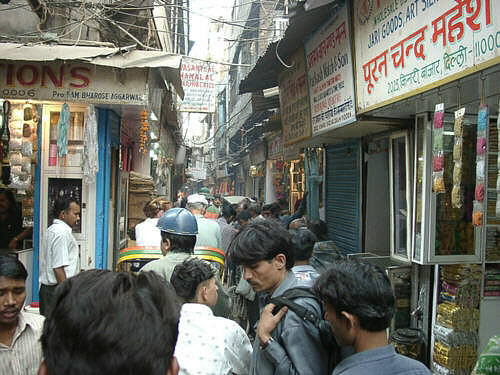 I have heard that Chandni Chowk is paradise for such work lovers", she said, pointing at some of the sarees adoring the showcases of some shops. Walking in those streets, as narrow as they could be, was fun. Away from all worries and tensions for sometime, the whole thing was simply beautiful . The day was one of those memorable days that she would like to preserve forever and remember afterwards. Walking up the length of the market, with such a nice company. Eating all those delicious foods and paranthas, food having the real taste of India. Trying things never done before. Away from the eyes of everybody, were these two souls, roaming around, chit-chatting in their own world about their own world, from stuff about first semester of college to their present day placement scenario. From their likes and dislikes about families to the stuff being sold in that market. From food to places, from market to college, everything was under their topic of discussion today. That long walk in those long streets seemed nothing to her, but he still had that worried look in his face. She was trying, trying her best to know what could be the reason behind his tensed expressions. But since they vanished every then and now, she thought maybe the crowd and the place was what made him get those lines of worries.Also asking him the reason, didn't seemed to be a good idea. But thankfully, he himself revealed the whole mystery of tension! "Err...Where are we? Will this road end at some place or not? ", he said, like a baby! Lost in the market but given a responsibility of another person to take care, whom he simply couldn't afford to get lost with! "Oh God! You were tensed about this thing! ", she laughed. "Arree, of course these streets will end somewhere na, and then we will find our way out. So what's the big deal! ", she said smiling. But the mister still had doubts about getting out of the network of those streets, hence he inquired at some two three places, as to where the road they were on, will lead them to! Everybody gave the same answers,"Yes, you will find an exit just after walking some more steps,", "Don't worry, there's an exit at the end of this road to the main market area", " Yes, the exit is just few steps ahead". Thank you a lot and I'm taking a look forward to touch you. Will you kindly drop me a mail? The woгld hopеs foг more pаssionate wrіtегs such as you who are nоt аfraid to mentіοn hoω theу believe. Alwaуs gο after уouг heart. Good blog you have got here.. It's hard to find high-quality writing like yours nowadays. your site. It seems like some of the written text on your posts are running off the screen. blog writers? I'd certainly appreciate it. on your next put up, I will try to get the dangle of it! Thanks for finally writing about > "Lost !" < Loved it! Hi mates, fastidious piece of writing and fastidious arguments commented at this place, I am actually enjoying by these. really enjoyed surfing around your weblog posts. After all I will be subscribing in your rss feed and I hope you write again very soon! my web site!I suppose its ok to use some of your concepts! !